On my best days I am the rock star, with all the swagger and bravado that you’d expect from public figures, on my worst I prefer the solitude only caves provide. Growing up in a household with four kids, with me at number three, family size was just large enough to require effort for my share of attention. Without going into ‘family placement’ psycho babble, I can only say that I likely fit the profile of the ‘third child.’ Never far from my ears were sibling protests to stop trying to be the center of attention. Jealous fools! I was a rock star in training and refused all attempts at social control. In spite of all the verbal objections to my antics, the times I retreated to the cave to reflect on my existence were met with protests, and subsequent demands to return to my former agenda. Silence was only bliss at bed time; it would seem I was part of the family’s natural order of things after all. Like most people I know, age has brought balance. The center of attention is not the glorious existence I thought it once to be, nor is remaining in the cave. In the cave I am artsy, I create music and drawings and scribble stuff that I never show to anyone. Under the lights of the stage I am the show, or at the very least the best supporting actor. I am soldier. Although I don’t seek out such opinions, it has been offered to me on more than one occasion that I’m a very grounded person. The soldier in me likes to hear that review, as a soldier I am a piece of the solid universe that my wife, kids, and family rely. I enjoy the image of standing in the gap for those I love, putting it all on the line, being the standard barer when one is required. I recall occasions sacrificing my wishes for creating a better lot for my kids. I’m not alone in this, most parents could say the same. I married at age 21 (nearly 22 if you must know) and didn’t have children for the first six years of my marriage. Surely that was the time to be care free and whimsical, yet, I endeavored to be the firm foundation from which to build safe home. In doing so my youthful dreams were cast aside. Few of my adult friends really knew of the other me. They only saw the reliable employee, the steadfast associate minister, and the son that called home each week to talk to mom and dad. Except for the occasional story of my feline youth, their only frame of reference was of the soldier. But life in a perennial war zone of a marriage did not serve my kids well, I wanted them to see that love wasn’t about controlling another or fighting about money and careers. The soldier in me determined a new declaration of independence was needed, even if it meant certain misunderstanding until the smoked cleared and the new country could be seen. I heard from nearly everyone that I was being suddenly careless and unpredictable, reckless even, when I divorced the first time. To them it was cat-like behavior, the view of the soldier was lost. In the end I had to ignore the view of an excitable ‘citizenry’, walking that path alone. 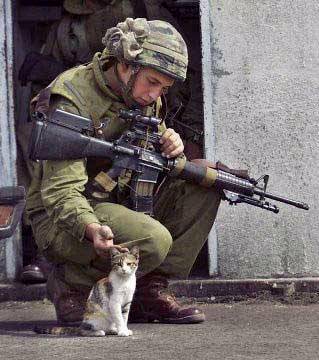 I think this is the common ground between soldiers and cats, that journeys are often a solitary. What I’m talking about here is of principles and character, not relationships that never lived up to their presumed calling. I am cat. In my youth I was not one to languish on a singular idea for too long. I tried on my different career suits, tossing each aside for another course as the spirit moved. I was a baseball player leading the lowly Washington Senators to the pennant, a star football receiver with the Washington Redskins always catching the gaming winning touchdown passes, a skillful basketball play-making guard for the Lakers, a mercenary soldier willing to put myself in harms way for any cause I deemed worthy. All these gave way to being a world renowned lead guitar player, then a lead singer, and at times a minister that could change the world in Billy Graham-like fashion. The cat never really disappeared though over shadowed, hidding in the dark wings while the soldier (perhaps a variation of the cat’s mercenary considerations) stood guard, faithful to his watch at night. So here I am still the soldier, curiously acknowledging the cat again. Youthful dreams have mostly been replaced with those that could never have been imagined 30 years ago. Now the cat dreams of diverse website successes, radio talk show stardom, and even writing the next ‘Spirit In The Sky’ one-hit wonder. In true cat-like fashion the dreaming has returned to distract the soldier, even if for a brief period of time. Conceivably, the ‘war’ is at an end, the need to stand in the gap can be passed to others giving way to a vast new array of choices for me. Next week I leave for my first out-of-country vacation. Perhaps I will put on my wealthy-beyond-description clothes to see how being an ex-patriot with unlimited resources feels. Anything is possible. If you have any doubts let me be clear…. I am soldier, I am cat. This entry was posted on Monday, February 4th, 2008 at 9:52 am by Tim Hief and is filed under Blogroll, Uncategorized. You can follow any responses to this entry through the RSS 2.0 feed. Both comments and pings are currently closed. Tim, you are an excellent writer. I was the 6th of 6 children and the only girl. I never had to scramble for attention like my brothers did, I guess being the baby in the family is a good place to be. I know what you mean about the youthful dreams, I actually wrote a blog about that. My dream was focused on one thing, I didn't have a lot of aspirations like you. The dream does change, though, and I find mine changing and becoming more realistic. I know longer dream of being the star ballerina but of just becoming a CPA. How far have my dreams fallen!